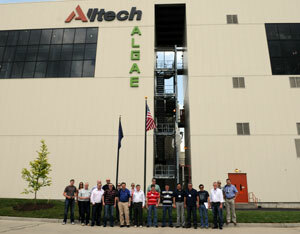 My first stop after registering for the Alltech Symposium was the tour of their new Winchester, KY Algae plant. Here’s one of the many tour groups getting to see the facility in action today. The company purchased the plant late last year and is in the process of fully converting it into a scaled-down replica of a large production system that will allow Alltech to research and perfect production methods before rolling them out on a large scale. The plant contains fermentors that stand over 8 stories high and have a capacity of 265,000 liters. Once they get into full 24/7 production this plant will produce about 10,000 metric tons of algae material per year. The algae produced by the plant can be used in animal feed, food supplements, pharmaceuticals, bioremediation and biofuels. While I was waiting on a tour to get started I spoke with Kyle Raney who works for Alltech in applications research with a focus on algae. He describes the facility and the projects they’re working on right now. Many of the algae products they produce will be used by Alltech’s own animal nutrition products as well as being sold to other customers. Follow the action on the Alltech Innovations Blog, including photos, interviews and there will be live streaming of certain sessions.